Hearing loss is becoming more and more common with each passing year. Though this epidemic continues to go unnoticed and ignored, the numbers don’t lie. According to the National Institute on Deafness and Other Communication Disorders, nearly 40 million Americans have hearing loss! Did you know that hearing loss is among the top three most prevalent health concerns among older adults in America? 1 in 3 adults in their 60s have hearing loss, and half of all seniors over the age of 75 struggle to hear. Age related hearing, or presbycusis, is extremely common. This hearing loss is caused by the natural wear and tear of life, as the cells in your ear become more susceptible to damage. Age related hearing loss is a slow process, and this kind of hearing loss can often go unnoticed for a year or two, since day to day changes in hearing are quite minimal. The first sounds to be affected are high frequency sounds, like the sound of children laughing, or the birds singing in the park. If you have age related hearing loss, you’ll also notice that it becomes harder and harder to follow conversations in places with a lot of background noise. This is because your ears and brain simply don’t have the processing power to sort out which sounds are important speech sounds, and which are distracting background sounds. 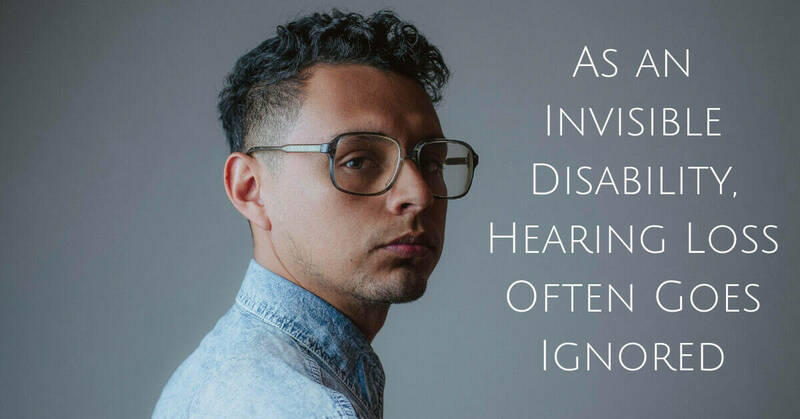 Hearing loss have often been called an invisible disability. For adults with age related hearing loss, struggling to hear can seem like a natural part of aging, and not a sign of a disability like hearing loss. In fact, your family is much more likely to notice your hearing loss than you are. Hearing loss is also called an invisible disability because you can’t tell someone has hearing loss by looking at them. Unlike seeing someone with a cast on a broken leg, there’s nothing visible that identifies someone with hearing loss, or signals that they need treatment. With no visible markers, it is easy for hearing loss to go unnoticed, and even those living with the disability don’t realize how much of an impact hearing loss has on their lives. Tragically, only 1 in 5 people who have hearing loss ever seek treatment or visit an audiologist. Many believe their hearing isn’t too bad, or that treating hearing loss won’t make much of a difference. Thousands of Americans wait until they can’t communicate in any situation and their hearing is severe before considering hearing devices. Despite its prevalence among seniors, hearing loss often goes ignored when seniors are diagnosed with cognitive decline or memory disorders. Those who choose to ignore their hearing loss don’t realize the implications of living with untreated hearing loss. Hearing loss isn’t just about struggling to follow conversations every now and then, but has a profound impact on daily life, health, and wellbeing. Those with hearing loss struggle with their careers, and are often overlooked for promotions. Unable to communicate effectively with friends and loved ones, they often face social isolation, feelings of loneliness, and depression. Hearing loss has also been linked to higher rates of anxiety, anger, and frustration, as well as fatigue and insomnia. Finally, numerous studies have shown clear links between hearing loss and dementia, and those with hearing loss face rapid cognitive decline as compared to their peers who seek treatment. On average, people wait 5 to 7 years to seek treatment for their hearing loss, and face many years of communication hardships. Don’t be part of this statistic, and don’t ignore your hearing loss! You owe it to yourself and your loved ones to treat your hearing loss, keep communicating, and keep your brain healthy. Visit us at Pacific Northwest Audiology today for a hearing assessment and consultation. Together, we’ll find out what you can and can’t hear, and find the perfect device that will get you back to joking with your friends, sharing special moments with your loved ones, and enjoying life to the fullest. Our hearing aids will fit seamlessly into your life, and you’ll be glad you took a stand and decided not to ignore this invisible disability.